When the weather starts to take a chilly turn, I get excited about fall flavors. These earthy root vegetables pair well with the citrusy orange-tarragon vinaigrette, a combo that the whole family can get into. 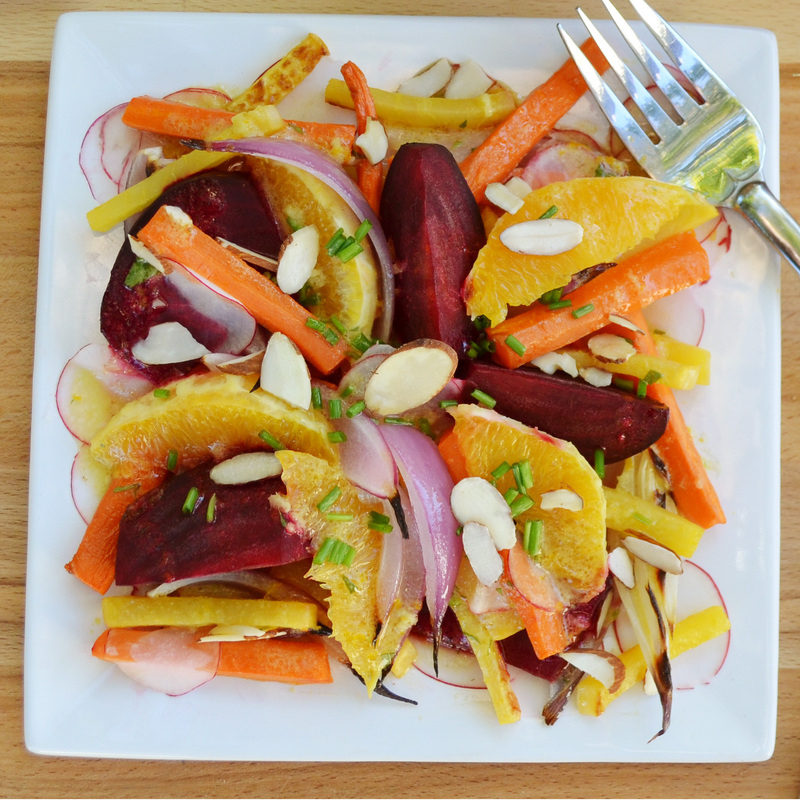 The vegetables in this salad are nutritional powerhouses – beets are high in folate, manganese and potassium, rutabaga packs in the Vitamin C and just one carrot has more than 200 percent of your daily requirement of Vitamin A. Place the whole beets on a cookie sheet and roast at 375 degrees for about an hour, or until just tender. While the beets are roasting, peel the rutabaga and carrots. Slice them into batons, roughly 1 1/2 inches long and 1/4-inch square. Brush with some olive oil, season with salt and pepper. Set aside. When the beets are tender, remove them from the oven and let cool. Once cool, peel and cut each beet into eight wedges. Roast the carrots and rutabaga on a flat cookie sheet for 12 to 15 minutes, or until tender, at 475 degrees. Cut the onion into eighths leaving the root end intact. Brush with olive oil and roast for 20 minutes at 475 degrees. While the onions are roasting, slice the radishes into paper thin slices on a vegetable slicer or mandoline. 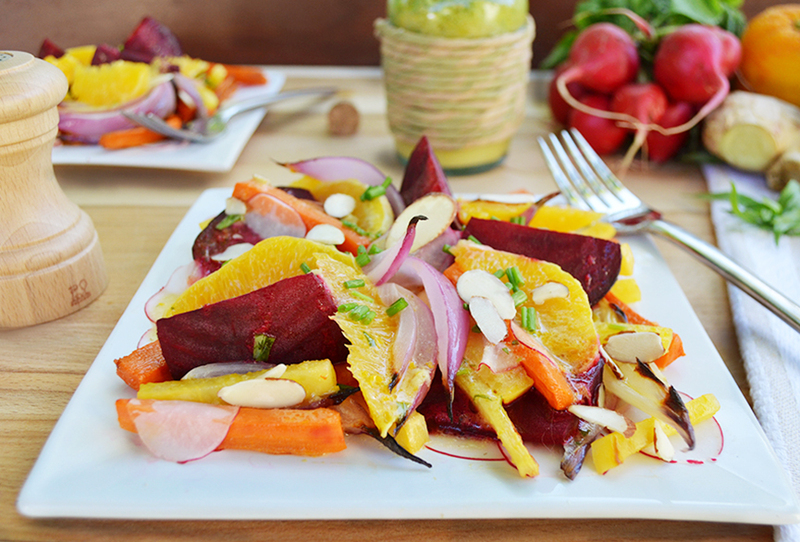 Arrange the rutabaga, beets, onion, carrots, oranges and radishes divided onto 4 plates. Garnish with the chives and toasted almond slices (feta cheese or shaved ricotta salata makes a nice addition as well). Serve, passing the vinaigrette at the table. Whisk all of the ingredients together to combine. Season with sea salt and serve. Save any extra dressing to use on green salads or veggies later in the week!